What happened in January is that I saw films; 58 logs on my Letterboxd account. Ten of those were seen at the cinema: Star Wars: The Last Jedi, Molly’s Game, All The Money In The World, Downsizing, The Greatest Showman, Darkest Hour, Three Billboards Outside Ebbing, Missouri, Coco, Pitch Perfect 3 and The Post. The Last Jedi was a rewatch and I’m firmly in the ‘loved it’ camp. Jessica Chastain gave yet another excellent performance in Molly’s Game. Can someone give Christopher Plummer an award for best villain in All The Money In The World already? Downsizing was a disappointment, great idea though. “This Is Me” from The Greatest Showman is still an earworm for me. Darkest House and Dunkirk are now the perfect companion pieces. 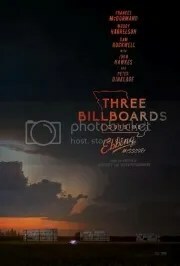 All the praise for Frances McDormand’s performance in Three Billboards Outside Ebbing, Missouri. Please and thank you. 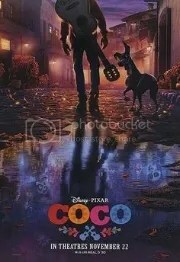 Oh, what a wonderful film Coco was! Pitch Perfect 3 rounded up the Bella’s story nicely. Leave it there, folks. 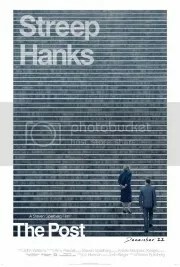 For once, I enjoyed a not overly sentimental Spielberg in The Post. I wonder how well it went down with the neo conservative lot. I also started watching Black Mirror to see what the fuss is all about. I’ve finished the first two series and will start the American ones soon.